Tarot of Ceremonial Magick is the synthesis of what author Lon Milo DuQuette terms the three great pillars of magick: Astrology, Enochian Magick and Goetia. We must assume he knows what he is talking about since he is the Deputy Grand Master of Ordo Templi Orientis (O.T.O. ), one of the most influential magical societies of the 20th Century. 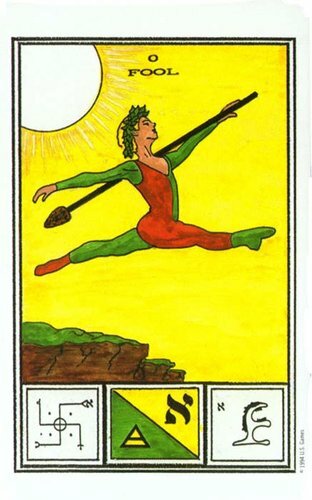 He describes the Tarot as a living mandalla - a pictoral depiction of the mechanics of creation. In the Tarot he sees a visual representation of its' Kabbalistic foundations. He goes on to claim that the fifth element - that of Spirit - reveals itself in the four Aces and the Court Cards.